Learning to write is a complex task. Choosing a hand to hold the pencil with, pencil grasp, managing the paper with the assisting hand, sitting up strait..and then there is the physical task of marking letters: letter formation, line awareness, letter size... this is multi-level functioning for a child! 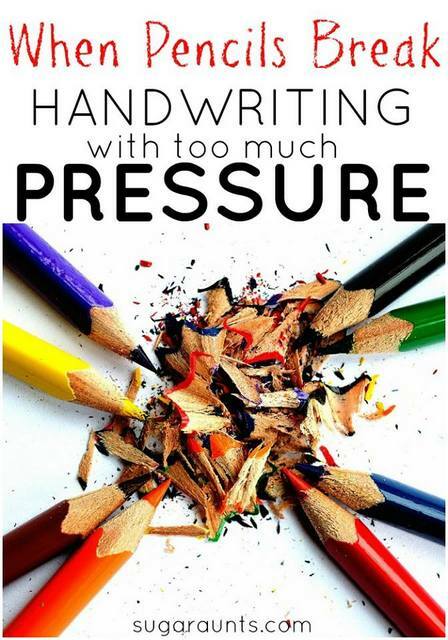 Yet another aspect to consider is the pressure one exerts on the paper when writing. Press too lightly and the words are barely able to be seen. Press too hard, and the letters are very dark, the pencil point breaks, lines are smudged, and when mistakes are erased, they don't really erase all the way, the paper tears, and frustration ensues! Pencil pressure is dependent on proprioception, one of the sensory systems. With October being Sensory Processing Awareness month, this is the perfect time to talk sensory and handwriting! As an occupational therapist in the school setting, I've come across many school-aged children showing difficulty with pencil pressure. There are reasons for these dark pencil marks and some tips and tools for helping with this handwriting difficulty. What is the Propriocetive system and how does it relate to handwriting? The proprioceptive system receives input from the muscles and joints about body position, weight, pressure, stretch, movement and changes in position in space. Our bodies are able to grade and coordinate movements based on the way muscles move, stretch, and contract. Proprioception allows us to apply more or less pressure and force in a task. Instinctively, we know that lifting a feather requires very little pressure and effort, while moving a large backpack requires more work. We are able to coordinate our movements effectively to manage our day's activities with the proprioceptive system. The brain also must coordinate input about gravity, movement, and balance involving the vestibular system. When we write, the pencil is held with the index finger, middle finger, and thumb, and supported by the ring and pinkie finger as the hand moves across a page. A functioning proprioceptive system allows us to move the small muscles of the hand to move the pencil in fluid movements and with "just right" pressure. We are able to mark lines on the paper, erase mistakes, move the paper with our supporting arm, turn pages in a notebook fluidly, and keep the paper in one piece. Sometimes, children hold their pencil very tightly. They press so hard on the paper, that lines are very dark when writing. The pencil point breaks. When erasing, the pencil marks don't completely erase, and the paper is torn. The non-dominant, assisting hand moves the paper so roughly that the paper crumbles. When turning pages in a notebook, the pages tear or crumble. Movements are not fluid or efficient. Handwriting takes so much effort, that the child becomes fatigued, frustrated, and sore. It may take so much effort to write a single word, that handwriting is slow and difficult. Messy. Messy handwriting can be contributed to many factors. Decreased hand strength, Visual motor difficulty, motor planning issues, visual memory difficulties, or impaired proprioception. Difficulty with grading the movements required in drawing or making letters in a coordinated way may present as messy, smudged, illegible handwriting. Proprioceptive activities allow the muscles to "wake up" with heavy pressure. Moving against resistance by pushing or pulling gives the muscles and joints an opportunity to modulate pressure. Resistive activities before and during a handwriting task can be beneficial for children who press hard on the pencil. theraputty with graded amount of resistance (speak to a license occupational therapist about the amount of resistance needed for your child. An individual evaluation and recommendations will be needed for your child's specific strengths/needs). Write with a mechanical pencil : The lead will break if too much pressure is applied. Children can learn to monitor the amount of pressure used and it will provide feedback on modulation of pressure. A pencil with .7mm lead is better to start with for heavy writers. Read more about using a mechanical pencil for kids who write too dark or too light. Older children can write with a liquid gel pen for fluid handwriting marks. The gel ink will provide feedback when gobs of ink are dispensed when writing too hard. Practice letter formation and pencil pressure by lacing a sheet of paper over a foam computer mouse pad. If pressing too hard, the pencil point will poke through the paper. A vibrating pen provides sensory feedback to the fingers and hand and helps to keep children focused on the task. Practice handwriting by placing a sheet of paper over a piece of sandpaper. The resistance of the sandpaper is great heavy work for small muscles of the hand. Practice Ghost Writing: Encourage the child to write very lightly on paper and then erase the words without leaving any marks. The adult can try to read the words after they've been erased. If the words are not able to be read, the writer wins the game. Hand exercises are a great way to "wake up" the hands before a handwriting task. Encourage the child to squeeze their hand into a fist as tight as he can. Then relax and stretch the hand and fingers. Repeat the exercise several times. Practice holding the pencil with the same type of tight and relaxed exercises Practice writing on tissue paper. A very light hand is needed to prevent tears. Discuss the amount of pressure needed for writing on the tissue paper. This will provide the child with awareness and words for the way they are holding the pencil. Wrap a bit of play dough or putty around the pencil as a grip. Encourage the child to hold the pencil with a grasp that does not press deeply into the dough. Encourage using a "just right" pressure. Provide terms for they way they write. Encourage "just right" writing and not "too hard" or "too soft" marks. Use a lead pencil to color in a small picture, using light gray, medium gray, and dark gray. Talk about how using different amounts of pressure changes the shade of gray. Instead of writing on a notebook, pull a single sheet from the pages and place on a hard table or desk surface. The firm surface will limit the amount of pressure. You can also slip a clipboard between pages of a notebook to provide that hard surface, if sheets must remain in a notebook. Looking for more prorioceptive activities? The sensory fix tool kit may be just the thing needed for home or school. Filled to the brim with proprioceptive and sensory tools, this kit is perfect for every day sensory needs. If you were to purchase these items in stores or separately, it would cost over $200. The Sensory Fix tool kit is offered at a 35% discount and with free shipping over $75. There's lots of other freebies included like newsletters and printables. Read more and get yours by clicking the link above or the image below.